Your privacy on Facebook and why you should protect it. Though personally I wonder why it is yet called a ‘Privacy’ policy. If you value privacy as much as I do, keep on reading. Why should we care about privacy? Our privacy is now at risk, much more than it ever was. The slow and bureaucratic legal systems can’t keep up with the pace of innovation, and that leaves you, the citizen, exposed. The last privacy law that got passed in the United States dates back from 1986. The last one in Belgium dates back from 8 December 1992. However these laws do not protect our privacy against the possible intrusive and nefarious ways on how our personal information is collected, processed and shared with other commercial entities, governments and legal departments. Privacy is indispensable for our liberal democratic political system. Freedom from surveillance gives you the capacity for critical self-reflection, and the liberty to do what you want to do. I’m not talking criminal offenses here, but developing yourself. The freedom to try out new things, go to places, meet new groups of people, without the risk of being judged by peers, or a government or organization keeping track of that, which can be used against you. Privacy is how you have the freedom to become who you want to be. Luckily for us, there are various non-governmental organizations that occupy themselves with privacy, such as the Electronic Frontier Foundation. 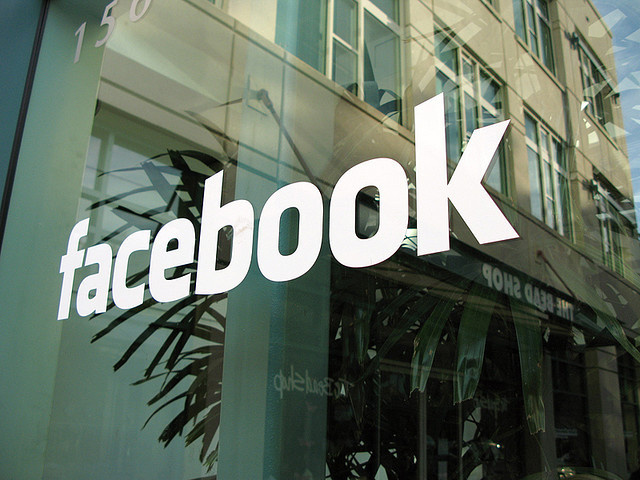 Ever since March 2013 Facebook started developing its messaging app, called Messenger. Don’t you find it curious that suddenly you can’t send Facebook messages anymore through the mobile version, and you are forced to download and use its Messenger app? In an email, Zdziarski claimed that Messenger is logging practically everything a user might do within the app, from what and where they tap with their finger, to how often a device is held in portrait versus landscape orientation, even time spent in the Messenger app, versus the time it spends running in the background. The app itself always runs in the background, and it will even restart itself if you somehow killed the service process on your phone. Some of this is expected behavior, and actually useful to gather statistics about (as an app developer). It gives you insight on how your application is being used, and gives you ways to improve it. However, Zdziarski found more concerning things. 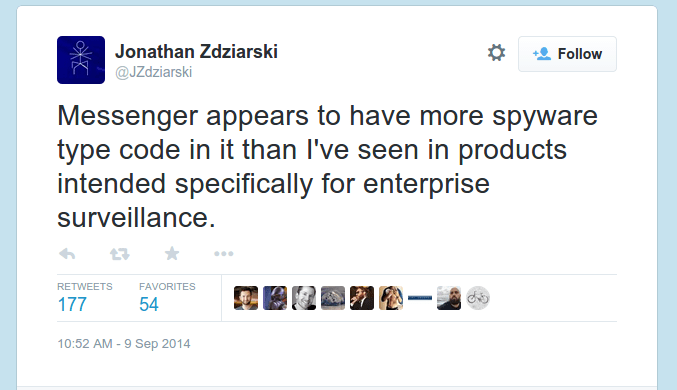 On Twitter, Zdziarski said he’s worked for companies that write enterprise surveillance software that didn’t know this level of access was possible. Why would facebook want to keep track if you are dead, your credit card billing information, having access to your microphone at all times, and the ability to start calls on its own, and messages? Bottom line is, the Messenger app can do much more than what shows up in your vague “Permissions list” when you install the app. WhatsApp is an application that sends messages to other people who also have WhatsApp installed, it only works if you have Wifi or roaming enabled. Facebook actually is starting to dominate the world in terms of usage. Only the Russians have their own (state-controlled- VKontakte, the Chinese have QZone, and some parts in the Middle-East use Cloob. The rest is all Facebook. Observant people probably noticed this and have read it. The fact you even continue to use Facebook (as in: use the messenger App or have your account still active) you agree with these new terms. Vice.com asked a privacy lawyer about these new terms, and what it will mean for you. VICE: So these 10,000-word TOS every company has—they’re long, complicated, and boring on purpose, right? ​Maninder Gill: To be fair, Facebook has acknowledged that people rarely read these long and complicated TOS and have taken steps to simplify and shorten theirs. However the reality is probably that, no matter how short the TOS are, most people are still not going to read them—they would rather deal with the consequences of blindly agreeing to them than bothering to carefully read them. The reality is that most users would rather agree to sign away some of their privacy rights than not be on Facebook. And Facebook knows this and thus keeps widening its rights to use our data and personal information. Do you see anything about Facebook’s new TOS that are particularly alarming? ​Facebook says that it has introduced “Privacy Basics” [“interactive guides to answer the most commonly asked questions about how you can control your information on Facebook”] in a bid to dispel confusion over how your information is used. It claims to be attempting to give more control to its users, provide location information to friends, and improve battery life and signal strength. As with most companies, there is an additional unstated business goal: to sell more advertising. In pursuit of that goal, every bit of personal information is a valuable data point that the company can exploit, and Facebook gathers users’ details so that they can sell more advertising at higher rates as, through this, they can truthfully claim to be able to better target their ads. ​Individuals will be able to allow their friends to track their every move. So users can now inadvertently agree to sign away their privacy rights, implications of which they may not be aware of. ​​Facebook have obtained our permission, as their conditions state that the company may use information on location “to tell you and your friends about people or events nearby, or offer deals to you that you might be interested in.” The company said it may also put together data “to serve you ads that might be more relevant.” So while it is Big-Brotherish, users have agreed to this by agreeing to use Facebook. The reality is that users would prefer to allow Facebook to use their data in any way than to switch to another social media platform. Overall, how much will Facebook’s new TOS affect our online lives? ​With Facebook now knowing where you eat, where you travel, where you shop, and who you are with, they could have a detailed database covering all aspects of users’ lives. ​Out of all the TOS I have dealt with in 20 years, Facebook’s are the most intrusive. To be granted rights to track an individual’s movements, and thus the people that would be with those individuals, and to potentially commercially exploit without permission all pictures posted on Facebook without specific consent, is breath-taking. Users must take responsibility for their data. Facebook’s ability to exploit our data is contingent upon our allowing them to do so. It is up to us to value our privacy and to spend a few minutes setting some restrictions on the privacy settings.